WATCH: The idea of seeing tiny twins going about their day in-utero seems like a far-fetched possibility, but thanks to amazing technology and a surgeon’s steady hand we’re able to sneak a peek at pre-birth life. A video shared by the Twins and Multiple Births Association (Tamba) is quickly going viral, because it offers an intimate view of twin life in the womb, long before these babies were due to make an appearance. The clip – filmed at 22 weeks gestation – was taken by a surgeon back in 2014. Dorset mum and dad, Sarah and Dan Maund, were attending London’s St George’s Hospital where a pregnant Sarah was due to undergo a laser ablation surgery to treat her identical twins’ Twin Transfusion Syndrome (TTTS). Not only did this surgery save her babies lives, it resulted in the first precious video of her twins. TTTS – the condition Sarah presented with and had her surgery to correct – occurs in around 10 to 15 percent of identical twin pregnancies which share a placenta. TTTS means that the blood from the mother’s placenta is not distributed equitably to both twins. When TTTS is present, blood passes from one “donor” twin to the other “recipient” twin in the womb. This results in the donor twin being smaller and anaemic because they have insufficient blood supply. The recipient twin will grow to be bigger and have a higher blood volume, but this may put a strain on the baby’s heart and can result in cardiac failure. Untreated TTTS results in fatal outcomes for 90% of babies affected. The untreated TTTS babies that do survive will have life-long health challenges. Professor Basky Thilaganathan – a surgeon and multiple birth specialist – was performing Sarah’s surgery when he caught her tiny twins on video. 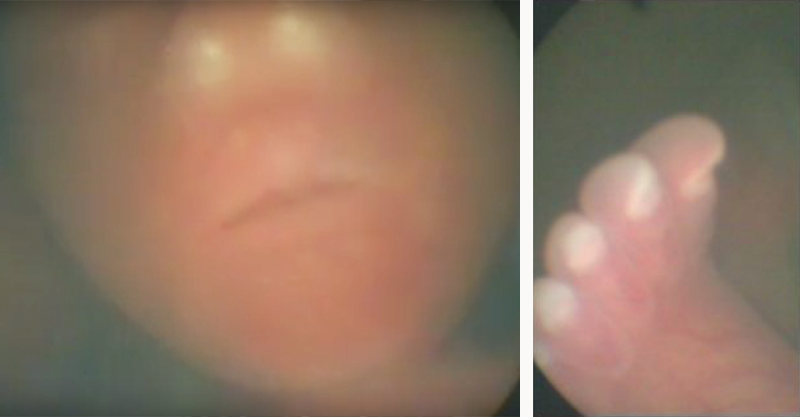 The ten minute footage was shot as Professor Thilaganathan investigated and worked on her placenta, and checked over her babies with a tiny camera. The footage reveals tiny feet, hands, faces, nails, elbows and limbs. It’s a mesmerising, rarely captured view of life before birth and we kind of can’t stop watching! Sarah’s TTTS-fighting surgery involved sealing off parts of the placenta, to even out the blood supply for the twins. After the procedure, the couple had to wait six terrifying hours to discover if their babies had survived the surgery, and if it had been successful. Sarah and Dan’s babies came through with flying colours. Henry and Sebastian were born healthy but early, at 32 weeks gestation. “When I look at the womb photographs and I look at the boys now, I can’t believe how far we’ve all come. It was an incredible gift for Professor Thilaganathan to give us,” Sarah told The Huffington Post. The couple hope that their amazing sneak peek at womb life will raise awareness of TTTS and encourage others to support the important work that twin charity, Tamba does. “I’d urge anyone to give what they can and donate to our TTTS appeal to save more tiny lives in future,” Sarah said. The clip below explains a bit more about TTTS laser ablation surgery – and offers some more glimpses at life in utero.